I tried this marbled brownie recipe, it seemed easy and quick to make…perfect for late-night baking. The recipe is adapted from Life’s a Feast, it’s supposedly a marbled brownie but it didn’t look and taste like a brownie to me, more like a pound cake with walnuts. It tasted good although mine turned out a bit dry and crumbly. I did follow the recipe to the letter..almost- except I added coffee powder instead of cinnamon; walnuts for pecans and used light brown sugar since it’s all I have in my pantry. 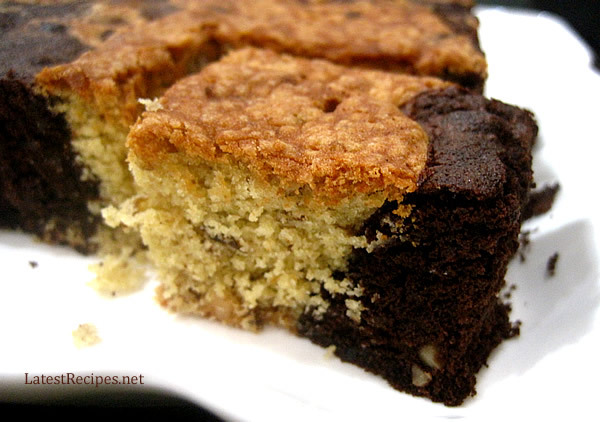 This cake tastes better after a day and a very good snack for kids paired with a glass of milk or chocolate drink. Happy Baking! 🙂 GOD Bless! Break the chocolate into pieces and place either in a small microwave-friendly bowl or the top of a double boiler; heat the chocolate until partially melted, remove from the microwave or from the heat and stir until completely melted. Set aside to cool at least slightly. Coarsely chop the nuts and set aside. Preheat the oven to 350°F (180°C). Lightly butter or spray a 15 ½ x 10 ½ x 1 –inch jelly roll pan or 13 x 9 x 2 – inch baking pan or line with aluminum foil and lightly butter the foil. Combine the flour, baking powder, salt and coffee powder in a bowl. Set aside. In a large mixing bowl, beat the butter until creamy on low speed. Beat in the sugar in four additions then beat in the eggs one at a time, adding the vanilla with the last egg. Scrape down the sides and beat until creamy and whipped up a bit. Beat in the flour mixture in about 3 or 4 additions. Fold in the chopped nuts while scraping down the sides of the bowl and blending in the last of the flour. Divide the batter in half; drop the vanilla pecan half of the batter in mounds around the baking pan. Beat or stir the cooled, melted chocolate into the remaining batter, blending well, then drop the chocolate batter in mounds in between and around the vanilla mounds of batter in the baking pan. Swirl the batters together with a knife to marble. Bake… this could take anywhere from 40 minutes to an hour depending upon the size of pan used (and depth) and your oven. When baked, the top of the brownies should be glossy and crispy, the center set; a tester stuck into the center should come out mostly clean.